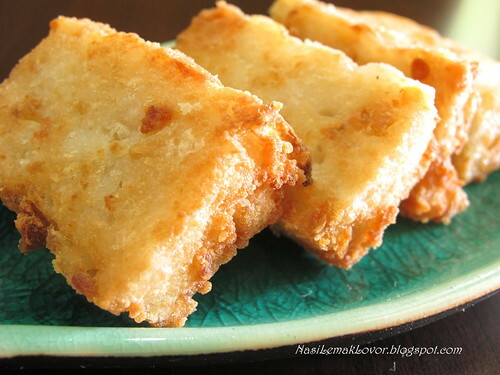 Nasi Lemak Lover: Fried white radish cake, simply delicious !! Fried white radish cake, simply delicious !! 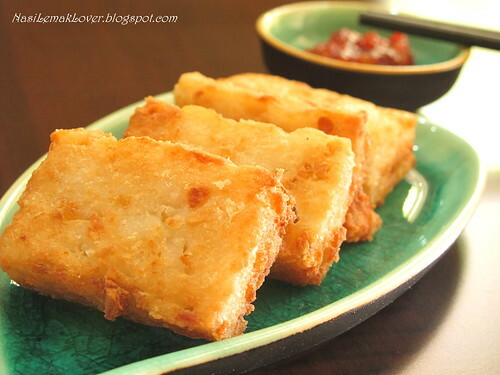 Fried white radish cake is one of the item that I must order when we take dim sum in restaurant. 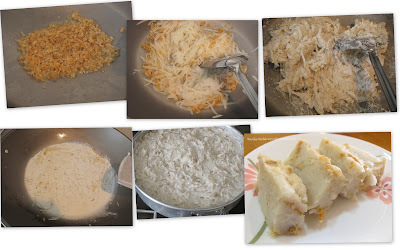 Actually this cake is very easy to be prepared at home, just use the steamed radish cake and pan fry it, and the ingredients and method are very similar to steamed taro cake. -How we enjoyed? 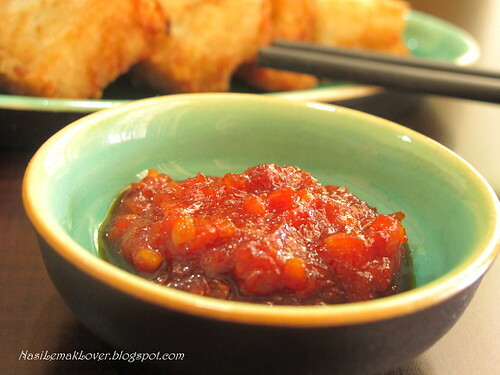 We like to eat with homemade sweet sambal, simple delicious !! -saute dried shrimps, add radish, add watery batter, cook till thick paste, steam become cake..
1. 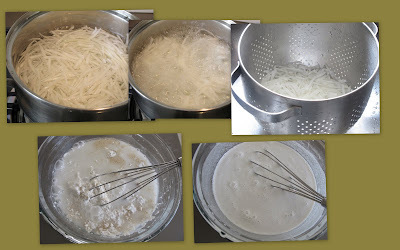 Mix all seasonings with rice flour, tapioca flour and water by hand whisk till a watery batter. 2. Heat oil in a wok, sauté chopped dried shrimps till fragrant. 3. Add in cooked shredded white radish, mix well, pour in the watery batter. 4. Cook mixture for two to three minutes over low heat, stirring all the time, until the mixture turns to a thick paste. 5. Pour the paste into a greased cake tin. Smoothen the surface with a spatula. Place it in the steamer and steam over high heat for 45 minutes. 6. Remove the cake and allow it to cool thoroughly before cutting into slices. 7. Dusted rice flour over radish cake, shallow fry the radish cake slices till golden brown. -I love the texture of this radish cake, neither too soft nor too hard, just perfect !! Now I start thinking to cook another usual way of enjoy radish cake, stir fry with egg and bean sprout, yum yum!! will share the recipe soon..
Oooh, your cakes are beautifully fried! I bet they're make an excellent chai tow kway too! This is a must order for us too at dimsum place. I just love how you fried it. Perfectly brown and I can see it is very crunchy on the outside. Oh u dusted with flour before frying, no wonder they have this crispy look.. Usually dimsum shop sjust plainly panfry them. Perfectly fried cake! Looks very nice! This looks so perfect. Very beautifully done. thanks for visiting our blog and u are always welcome to pur space.. I think your food photography have surpass me! "Chow Kueh"...ya ya, will wait for your post. I love that! YUM! Can I eat this now! I say that a lot on your blog!!! Oh this looks so good and your photos are just wonderful! I really do want one now! Love it! So crispy too! These look so good I'm going to have to try them. Hopefully your white radish is also called a daikon because that's what avaiable here. I've never heard of these but as you can see I'm really curious. Looks really crispy and delicious! I'm saving this recipe and will look out for white radish at the asian grocery next time :) Thanks for sharing Sonia. Mmmm....my favourite. I love it fried too. I enjoy ordering this at dim sum too! This recipe looks easier than I thought it would be. Wonderful! Lovely! Perfect little rectangles. Can't believe that this is from a radish. Yummy! This is one of my fav savoury cake! Really love it. I am so glad to find this recipe on your blog while I was reading Lily's Wai Sek Hong's blog. I just bought a radish last nite and plan to cook this for a friend's potluck party tonight. Thanks! MMmmmm~~Must have together with "tong shui"! Perfection!! love savoury snacks like these. yours look super lovely. Thank you for visiting my blog and your kind words. You have a really terrific blog too! I look forward to visiting your blog more in the future! New to me .Sounds unique and interesting! Is a white radish the same as a daikon radish? The look fantastic...I'm very interested in dim sum dishes since there are not many restraunts around here that serve them. I would really like to try this. Wah nice.. Can make "Chai Tao Kueh".. always in pasar malam one..
Wow,I like it very much.Looks very tempting. I have few awards waiting for you in my blog.Pls collect it. 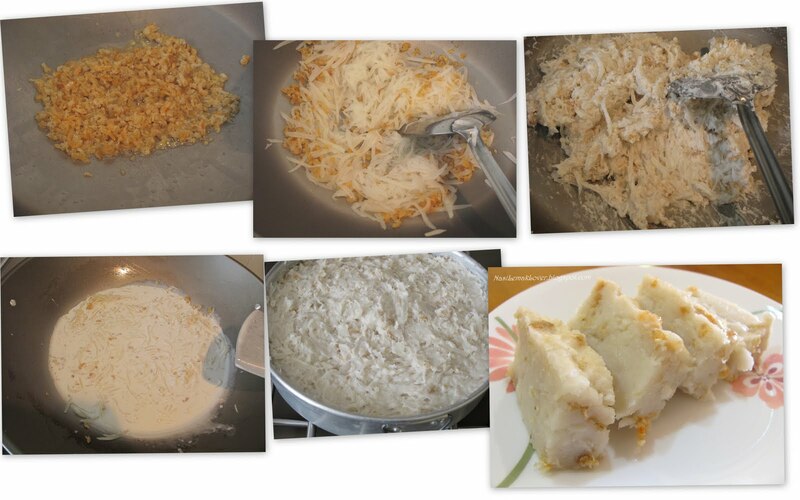 Oh..so many steps to prepare the radish cake =.="
Wow, another my favorite too! I like dipping with Kg. Koh chili sause, waaaa, yummy. gorgeous!! !But is thr a substitute for tapioca flour? Sonia, I made this and I loved it. One will never know there is radish in it. I like your step by step clicks !! Sonia, this is a must have when I go for dim sum. I also like the one fried with egg, bean sprouts and with some 'choy poh'. Thank you so much!!!! I was looking for this recipe for quite sometimes. Thank you, I am bookmarking this as one of my next thing to make. It's me again, do I have to cook the radish before I shred, or the other way around? Thank you..
cake look so mouthwatering , amazing recipe..gotta try..
Dear all, Thanks for your lovely words. Dear new comer, welcome to my blog. s, you may omit tapioca flour, but thought the texture will not so firm. elra, shred first then only cook. Hope this help. Radish cake also my favorite when ordering dim-sum but they seldom fry it to such crispiness like yours. Must be a lot of work making your own. I salute you! Thanks for sharing yr recipe. I have tried making this radish kuih last nite & pan fried this morning. It turned out very successful (very crispy on the outside and inside soft). Wish you can try some and let me know your comment. Will try to fry with eggs & chai poh with the remaining kuih tonight & let you know what's like. Thanks for the recipe! All the food you cook looks so delicious and I can't help but bookmark them to try! haha. I made this yesterday but for some reason, it came out quite firm. Not sure if it's because of the tapioca flour or if I should add more radish? Yakitori meal at Sumi-ka, Birthday gifts..